Another teenager in the family! Oh, how the years are flying by! This is a picture I took of Bella in the Butterfly House, earlier this month. 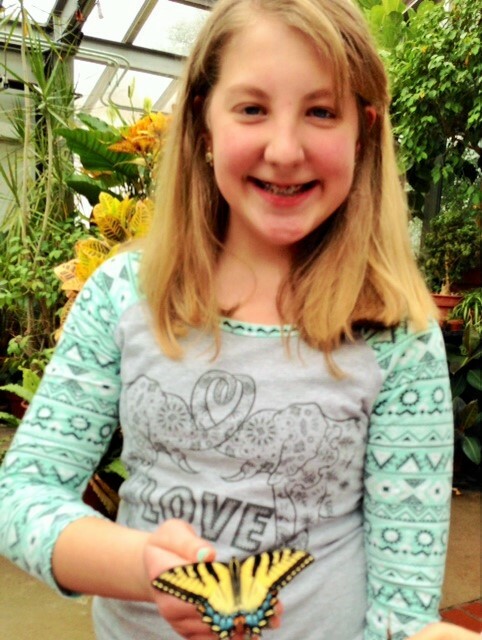 She’s holding a Tiger Swallowtail, I think! Anyway, it’s a really sweet picture of a very sweet girl! Bella has a very pleasing disposition and personality! She’s cute. She’s smart. She’s active. I wish we could celebrate with her today. But…she wanted me to do the impossible! She wanted me to make a cake, for her, shaped like the Eiffel Tower! She loves France and hopes to go there someday! She’s very fluent in Spanish…I think she’d better switch to French! I wish for you a super fun, fabulously great day! Heavenly Father, thank You for Isabella! She’s a delightful young teenager! Please watch over her at school, and at play. Keep her safe as she grows up. Please keep her loving and serving You. Help her as she makes friends, that she’ll be a friend to all but be close only to the ones who will be a good influence on her life. I love Bella so much and You love her even more! This entry was posted in Bella, Birthday, Butterflies, Family, France, Fun, Grandchildren, Spanish and tagged Bella, Birthday, Butterfly, Family, Fun, Grandchildren, Michigan. Bookmark the permalink. You are giving Isabella both roots and wings, the butterfly a great image of that! Thanks, Marian! What a beautiful thought!